Physalis peruviana, a plant species of the genus Physalis in the nightshade family Solanaceae, has its origin in Peru. The plant and its fruit are commonly called Cape gooseberry, goldenberry, poha, and physalis, among numerous regional names. It has been cultivated in England since the late 18th century, and in South Africa in the Cape of Good Hope since at least the start of the 19th century. Widely introduced in the 20th century, P. peruviana is cultivated or grows wild across the world in temperate and tropical regions. P. peruviana is an economically useful crop as an exotic exported fruit, and is favored in breeding and cultivation programs in many countries. P. peruviana is closely related to the tomatillo and to the Chinese lantern, also members of the genus Physalis. As a member of the plant family Solanaceae, it is more distantly related to a large number of edible plants, including tomato, eggplant, potato, and other members of the nightshades. Despite its name, it is not botanically related to gooseberries such as the Ribes gooseberry, Indian gooseberry, or Chinese gooseberry. P. peruviana is an annual in temperate locations, but perennial in the tropics. As a perennial, it develops into a diffusely branched shrub reaching 1–1.6 m (3.3–5.2 ft) in height, with spreading branches and velvety, heart-shaped leaves. The hermaphrodite flowers are bell-shaped and drooping, 15–20 mm (0.59–0.79 in) across, yellow with purple-brown spots internally. After the flower falls, the calyx expands, ultimately forming a beige husk fully enclosing the fruit. The fruit is a round, smooth berry, resembling a miniature yellow tomato 1.25–2 cm (0.49–0.79 in) wide. Removed from its calyx, it is bright yellow to orange in color, and sweet when ripe, with a characteristic, mildly tart tomato flavor. A prominent feature is the inflated, papery calyx enclosing each berry. The calyx is accrescent until the fruit is fully grown; at first, it is of normal size, but after the petals fall, it continues to grow until it forms a protective cover around the growing fruit. If the fruit is left inside the intact calyx husks, its shelf life at room temperature is about 30–45 days. The calyx is inedible. P. peruviana has dozens of common names across the world in its regions of distribution. For example, in northeastern China Heilongjiang Province, it is informally referred to as deng long guo. In French, it is called amour en cage ("love in a cage"), as well as other possible names, such as Peruvian coqueret, alkékenge, lanterne chinoise ("Chinese lantern") (Physalis alkekengi), cerise de terre ("earth cherry"), or tomatillo (Physalis philadelphica). Native to the mountain slope regions of Perú and Chile, where the fruits grow wild, physalis is locally eaten and frequently sold in markets in western South America. It has been widely introduced into cultivation in other tropical, subtropical, and even temperate areas, such as Australia, China, India, Malaysia, and the Philippines. The plant was grown in England in 1774 and by early settlers of the Cape of Good Hope before 1807. Whether it was grown there before its introduction to England is not known, but sources since the mid-19th century attribute the common name, "Cape gooseberry" to this fact. One suggestion is that the name properly refers to the calyx surrounding the fruit like a cape, possibly an example of false etymology, because it does not appear in publications earlier than the mid-20th century. Not long after its introduction to South Africa, P. peruviana was introduced into Australia, New Zealand, and various Pacific islands. 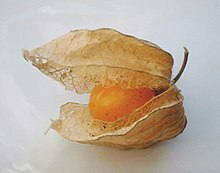 In the wild, Cape gooseberry grows in forests, forest margins, riparian and uncultivated locations. In South America, it grows at high elevations of 500–3,000 m (1,600–9,800 ft), but may also be at sea level in Oceania and Pacific islands where it occurs widely in subtropical and warm, temperate conditions. Its latitude range is about 45 to 60, and its altitude range is generally from sea level to 3,000 m (9,800 ft). P. peruviana thrives at an annual average temperature from 13–18 °C (55–64 °F), tolerating temperatures as high as 30 °C (86 °F). It grows well in Mediterranean climates and is hardy to USDA hardiness zone 8, meaning it can be damaged by frost. It grows well in rainfall amounts from 800–4,300 mm (31–169 in) if the soil is well drained, and prefers full sun or partial shade in well-drained soil, and grows vigorously in sandy loam. The plant has become invasive in some natural habitats, forming thickets, particularly in Hawaii and on other Pacific islands. The plant is readily grown from seeds, which are abundant (100 to 300 in each fruit), but with low germination rates, requiring thousands of seeds to sow a hectare. Year-old stem cuttings treated with hormones to promote rooting are successful for planting, but have a lower rate of success than growing from seed. In South Africa, cutworms attack the Cape gooseberry in seedbeds, red spiders in the field, and potato tuber moths near potato fields. Hares damage young plants, and birds eat the fruits. Mites, whiteflies, and flea beetles can be problematic. Powdery mildew, soft brown scale, root rot, and viruses may affect plants. In New Zealand, plants can be infected by Candidatus liberibacter subsp. solanacearum. P. peruviana is an economically useful crop as an exotic exported fruit, and is favored in breeding and cultivation programs of many countries. P. peruviana fruits are marketed in the United States as goldenberry and sometimes Pichuberry, named after Machu Picchu in order to associate the fruit with its origin in Peru. Cape gooseberry is made into fruit-based sauces, pies, puddings, chutneys, jams, and ice cream, or eaten fresh in salads and fruit salads. Because of the fruit's decorative appearance in its showy husk, it is popular in restaurants as an exotic garnish for desserts. To enhance its food uses, hot air drying improved qualities of dietary fiber content, texture, and appearance. In basic research on fruit maturation, the content of polyphenols and vitamin C varied by cultivar, harvest time, and ripening stage. The fruit has a limited history for treating disorders in traditional medicine. According to nutrient analyses by the USDA, a 100 g serving of Cape gooseberries is low in energy (53 kcal) and contains moderate levels of vitamin C, thiamin, and niacin, while other nutrients are negligible (see table). Analyses of oil from different berry components, primarily its seeds, showed that linoleic acid and oleic acid were the main fatty acids, beta-sitosterol and campesterol were principal phytosterols, and the oil contained vitamin K and beta-carotene. Basic research on Cape gooseberry includes studies on polyphenols and/or carotenoids. 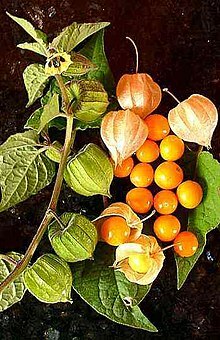 ^ "Physalis peruviana L." The Plant List. Royal Botanic Gardens, Kew and Missouri Botanical Garden. 2013. Retrieved 14 December 2014. ^ a b c d e f g h i j k l m n o p q r s Morton JF (1987). "Cape gooseberry, Physalis peruviana L. in Fruits of Warm Climates". Purdue University, Center for New Crops & Plant Products. ^ a b c d e f g h i j k l m n o p "Physalis peruviana (Cape gooseberry)". Invasive Species Compendium, CABI. 2018. Retrieved 1 January 2018. ^ Fr. Visminlu Vicente L. Chua, S.J., Philippine Fruits. Published online: 1 September 2015. ^ Liefting, L. W.; L. I. Ward; J. B. Shiller; G. R. G. Clover (2008). "A New 'Candidatus Liberibacter' Species in Solanum betaceum (Tamarillo) and Physalis peruviana (Cape Gooseberry) in New Zealand". Plant Disease. 92 (11): 1588. doi:10.1094/PDIS-92-11-1588B. PMID 30764458. ^ Galarza, Daniella. "This Goose(berry) is Cooked: Let's Talk About the Pichuberry". Los Angeles Magazine. Retrieved 19 April 2014. ^ Vega-Gálvez, A; Zura-Bravo, L; Lemus-Mondaca, R; Martinez-Monzó, J; Quispe-Fuentes, I; Puente, L; Di Scala, K (2013). "Influence of drying temperature on dietary fibre, rehydration properties, texture and microstructure of Cape gooseberry (Physalis peruviana L.)". Journal of Food Science and Technology. 52 (4): 2304–2311. doi:10.1007/s13197-013-1235-0. PMC 4375184. PMID 25829613. ^ Bravo, K; Sepulveda-Ortega, S; Lara-Guzman, O; Navas-Arboleda, A. A; Osorio, E (2015). "Influence of cultivar and ripening time on bioactive compounds and antioxidant properties in Cape gooseberry (Physalis peruviana L.)". Journal of the Science of Food and Agriculture. 95 (7): 1562–9. doi:10.1002/jsfa.6866. PMID 25131258. ^ "Groundcherries, (cape-gooseberries or poha), raw, 100 g, USDA Nutrient Database, version SR-21". Nutritiondata.com. Conde Nast. 2014. Retrieved 7 May 2014. ^ Wu, SJ; Tsai JY; Chang SP; Lin DL; Wang SS; Huang SN; Ng LT (2006). "Supercritical carbon dioxide extract exhibits enhanced antioxidant and anti-inflammatory activities of Physalis peruviana". J Ethnopharmacol. 108 (3): 407–13. doi:10.1016/j.jep.2006.05.027. PMID 16820275. This page was last edited on 22 April 2019, at 04:20 (UTC).